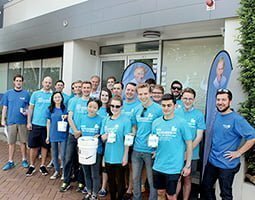 Bennelong MP John Alexander started the first leg of his 100 kilometre walk around the electorate of Bennelong on Saturday to raise money for Motor Neurone Disease. Mr Alexander is the first Bennelong MP to cover the entire electorate on foot and told The Weekly Times he hoped to raise awareness of Motor Neurone Disease, promote small businesses and meet constituents. “There are estimated 1,900 people with Motor Neurone Disease in Australia, each with an estimated life expectancy of only 27 months,” he said. “Those 27 months will see a steady disintegration of their muscles until they can no longer eat, breath, or talk to their loved ones. The walk started on Saturday with Mr Alexander walking over 12km on a route between his Electorate office in Epping and Waterloo Road in North Epping. The walk saw him visit shops in Epping and North Epping, the Poplars village and Epping North Public School where he attended their school fete. He was also joined by a number of volunteers and local residents. “It was wonderful to see so many people joining me and helping raise money for this worthy cause,” he said. For Mr Alexander, the walk was a deeply personal experience. “Last year I lost a close friend to Motor Neurone Disease,” he said. “He was a brilliant man and a loving husband and father, at the peak of his life. The 100km walk will take place throughout the remainder of October and November, and will cover every corner of the Bennelong Electorate. Mr Alexander’s route can be found on his website at www.johnalexander.net.au where TWT readers will also find a link to the fundraising page. “Additionally, a leaflet will come to your letterbox prior to his visit to let you know when I’ll be around your area,” he said. 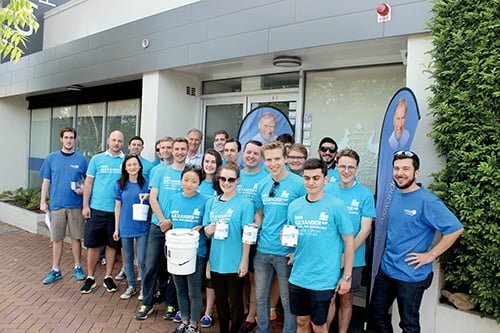 A team of volunteers joined Bennelong MP John Alexander last Saturday as he commenced his 100 kilometre walk through the electorate.